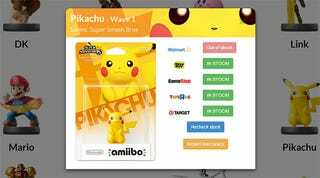 Reader Chris Ryan, keenly aware how damn hard it's proving to get your hands on certain Amiibo, has gone and built a website called Amiibo Trackr that can tell you at a glance which online retailers currently have which figures in stock. As soon as you click on one of the available Amiibo's, AmiiboTrackr runs the query for that specific Amiibo checking various stores stock level. The data is only checked as soon as you click on the corresponding Amiibo so you don't have to worry about extra load time checking all at once. Now, it's not perfect. It's only checking in two places (USA & Canada), and it's only scanning the biggest retailers (Best Buy, Future Shop, GameStop, Toys R Us and The Source), so it won't be trawling eBay or smaller sites for you. But hey, if you're looking for Amiibos from your couch/desktop and need to save some time (and grief), I'm sure this will still be helpful for loads of people!